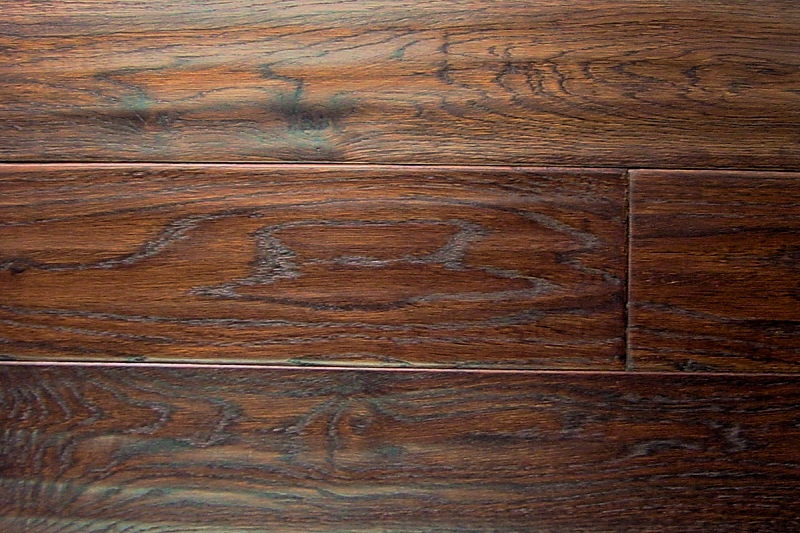 Hand-scraped Hardwood Floors have been used since the 1600’s. When engineered and laminate flooring came to market, customers were anxious to see and try the new products and demand for the timeless look and feel of hand-scraped flooring quelled. Our customers that purchase hand-scraped wood flooring desire the craftsmanship that highlights the wood’s imperfections. Today, hand-scraped can refer to sanding, denting or scooping to create small splits and indentations. To learn more about our hand-scraped hardwood floors Forth Worth, please contact our Customer Care professionals. For the finest, most distinctive hand-scraped hardwood flooring supplies, visit Hardwood Floors Fort Worth. Part of the resurgence in demand for hand-scraped hardwood flooring is due to the distinctive and masterful time-worn look that is once again back in vogue with discerning homeowners and business owners. There is something timeless and remarkably stable about hand-scraped hardwood, an option you should explore. The hand-scraped hardwood floor production process is much different than when the finishing work was performed by artisans in the 1600’s, but today’s hand-scraped floors are just as unique and much easier to maintain than the historic floors of yesteryear. If you want a truly classic look and feel for your home, special room or office, hand-scraped hardwood flooring can deliver the rich, customized appearance discerning buyers deserve. If you wish to expand your knowledge of hand-scraped hardwood floors, there is no better place to learn than in our Hardwood Floors Fort Worth showroom. Allow our Customer Care professionals to share their experience and knowledge about hand-scraped flooring by contacting us. You will immediately understand why Hardwood Floors Fort Worth is the leading authority on hand-scraped hardwood floors in the Dallas – Fort Worth area. It is these endearing qualities and today’s stylized finishes like high gloss, very level, flat and smooth wood flooring finishes that have created a boom in demand for hand-scraped hardwood flooring that began about 30 years ago. At Hardwood Floors Fort Worth, we recognize that certain products are cyclical but the spiraling popularity of hand-scraped floors is more than a fad. It is a link to our past, a link to history and in the southwest, we take our history very seriously. Unlike the smooth finished look of engineered floors or the more affordable laminate flooring, the uneven “piano finish” associated with hand-scraped hardwood sets every room and floor apart from the field. Our clients who choose hand-scraped floors definitely seek a rugged appearance versus the shiny, glossy look of other products. Our Customer Care team is standing by, waiting for the opportunity to discuss hand-scraped hardwood floors and all our related hardwood floor products. Give us a call to learn more about all your flooring options. When hardwood floors were the dominant flooring choice in the 1600-1700’s, craftsmen hand-scraped the hardwood planks to even out the differences between the raw boards. High gloss finishing did not exist. Today, discerning buyers can not only choose the historic hand-scraped look but they can also enjoy a variety of practical and stylish finishes. Truly, the art of the hand-scraped hardwood floors has never been more elegant and rich both in terms of aesthetic appeal and easy maintenance. When a home or office wants a realistic vintage look, inevitably hand-scraped hardwood flooring must be considered. The workmanship today rarely includes the use of hand-held tools but the outcome created by the use of powered sanders is even better. And, with many finishing options available, maintenance is lower and durability much greater. Make sure your investment is precisely what you envisioned. Contact our Customer Care team to arrange a meeting at our showroom where the best hand-scraped hardwood flooring is on full display.